Add and edit metadata in bulk (or individually). For example, when you return from a given archive, you can add one location and the data of access across the entire image collection. Allow the metadata categories guide your own research needs. Many of us use cameras on our smartphones to create images of what we’re reviewing in archives or documenting on field research. We then look at these photos on our laptops or desktops, especially when we need to consult these images while writing or when conducting additional research. 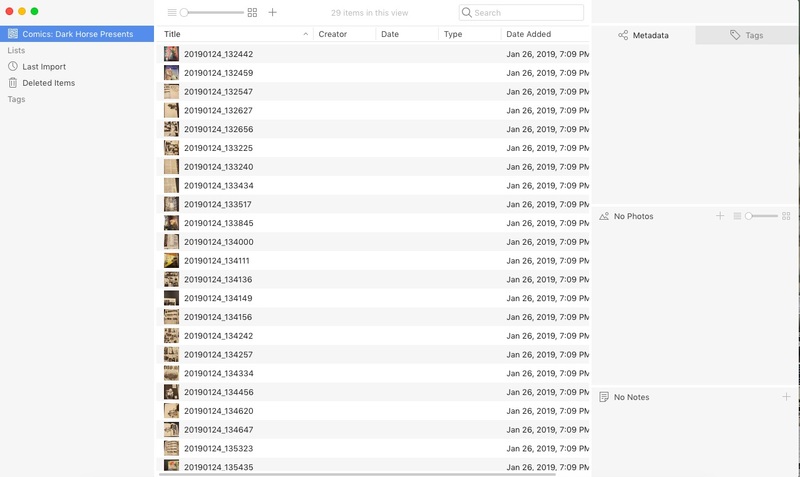 While storing copies of files in cloud-based storage services like Dropbox or Google Photos has its advantages (and might be part of your research workflow in some capacity for the purposes of creating backup files, among other reasons), saving research images locally on your hard drive allows you to take advantage of Tropy’s capabilities including metadata creation and management, transcription, and organization. Importing batches of files into Tropy is pretty easy: you can even quickly drag and drop materials into your virtual workspace. The 29 image files you see above are related to two issues of the 1990s comic book anthology series Dark Horse Presents. There are images of various story installments, front and back covers, advertisements, letters, columns, and editorial commentary. While this collection includes extensive photos (there are duplicates in cloud storage just in case something is blurry or cropped! ), the researcher might not want to wait too long to revisit the material. Even though cloud storage allows us to quickly migrate images from our phone to spaces that can be accessed by a range of devices, the convenience of these features can also make it easy for us to forget important contextual information related to our research. And sometimes, even when we take extensive notes by hand or on digital devices, that material can get lost or be difficult to retrieve if we’re not careful. Tropy allows you to use metadata in the way that works best for your particular research projects and workflows: it offers generic categories and Dublin Core fields, but you can also import templates or create customized templates with fields most relevant to your work. You can export metadata created in Tropy to use elsewhere. Whether you’re interested in documenting context for the purposes of searching and later citation, or you’d like to create organized data for use in Omeka S or other contexts, Tropy can help keep your work organized in the present and the future. As you organize, it’s important to keep in mind the terms Tropy uses. A “Project” refers to the larger research project (in this case, research into the Dark Horse Presents publication). Items only live in one project. 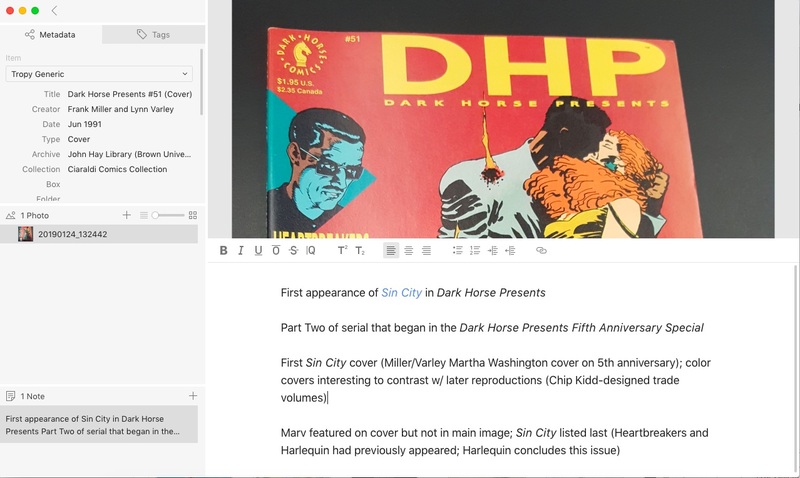 “Lists” allow you to further organize the various parts of your project: in this case, we’re using this feature to organize images related to individual publications (issues of Dark Horse Presents), stories (Sin City: The Hard Goodbye, a serial that appears across several issues of DHP), and particular content we’ll be focusing our research on more generally (advertisements, letters columns, and company editorials). “Tags” are ways to link items by particular people, themes, or other keywords. We’re using tags to track names of artists and editors of interest, names of characters and franchises, and kinds of artwork. 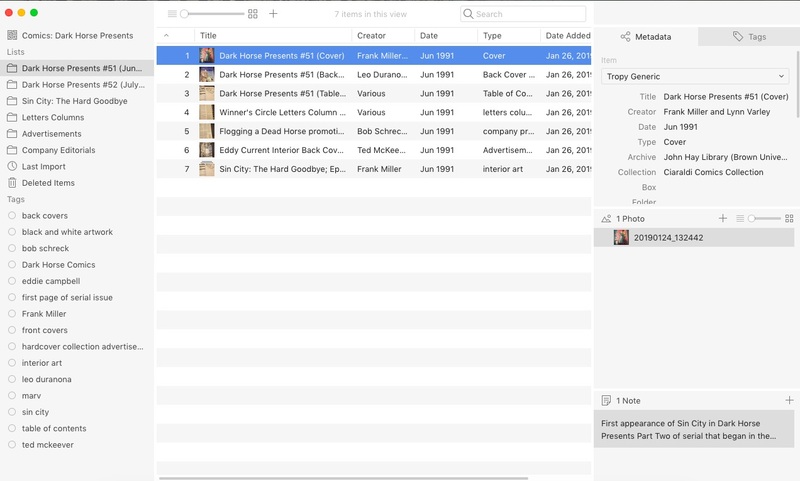 You can edit, rename, reorganize, and revise lists and tags as you go. We’ve already tweaked our organizational habits a few times this week as our research has developed and we’ve grown more comfortable with Tropy. As you can see, we’ve come a long way to organizing our material. There’s detailed documentation on what Tropy can and can’t do over at the project’s web site, and we’ve highlighted a few features that seem of particular interest to general users. You can register for the Tropy workshop here. We hope to see you there!